8-year-old Yahoshava was diagnosed with a brain tumour in July 2017. 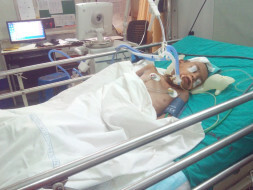 He is a class 3 student who is now on ventilator support. Yahoshava Borgaonkar is a little boy who loved to go to school. The news of his tumour came as a shock to the family. He underwent a surgery to remove tumour and is on the ventilator. His father, Prashant is a farm laborer earning as less as Rs. 3,300 a month. The child needs to be in the intensive care unit for a longer duration due to the requirement of ventilator support. Estimated treatment expenses are around Rs. 19.95 lakhs. 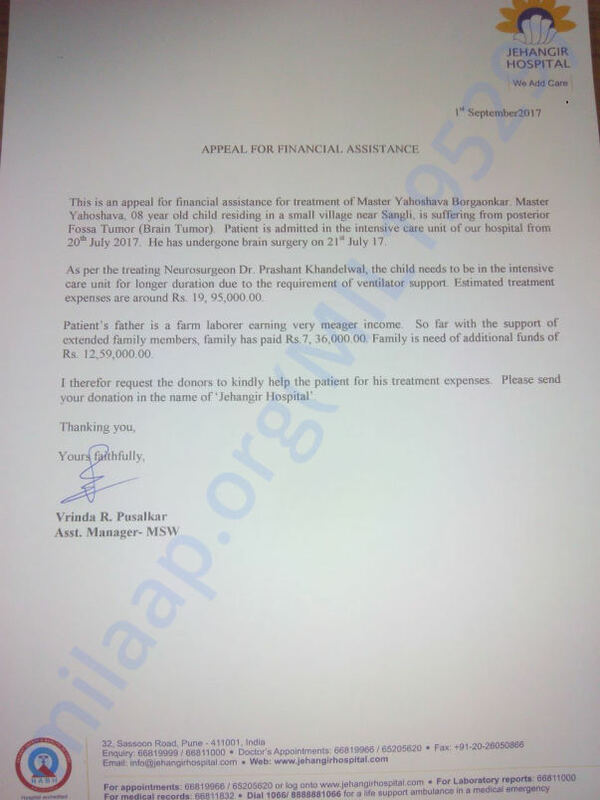 So far with the support of extended family members, the family has paid Rs 7.36 lakhs. The need our help to arrange the remaining 12.59 lakhs. We have some unfortunate news to share with you today. Yahoshava passed away in the early hours on Friday (15th September). He had clots in his brain and the doctors treated him for the same. He developed a clot in the left side of his brain a few days after the previous surgery was performed. The infections increased and then his White Blood Cells count starts increasing rapidly and the doctors were administering him treatment. He started responding well to the medication, both allopathic medicine, and ayurvedic medicines. He endured so much pain and fought so hard for his life. His infections relapsed and his respiration, heartbeat and blood pressure all dropped.Unfortunately, his body was unable to take the stress. Your timely support and blessings ensured that he received the best care. Thank you all for all the support, it supported us to give him the best of treatment. The funds raised via this campaign will be utilized for his medical treatment so far. May his soul find peace. Please keep him in your prayers.